It's funny when you look back at how you started cooking. I always helped Mum in the kitchen, even from a very young age, but when I was nine things quickly changed from helping to doing. My Mum had a really tough pregnancy with my little sister. I was only nine at the time, but I could see my Mum was struggling. In her last trimester she continued to try and do everything as normal but she just couldn't. My Dad worked a lot to support us, so it was just Mum and us kids (three under the age of nine) at home before dinner-time. After Mum was trying to vacuum the house one day she had to lay down on the couch and just couldn't move she was so exhausted. Being the eldest and seeing my Mum needed help I just stepped in. I got everyone in the bath, putting my younger sister Cakie (her nickname, of course) no more than seven years old in charge while I set off to find out from Mum what she wanted me to do for dinner with whatever she had out. From this point forward I learnt how to cook by myself quickly and in a very unorthodox way. My Mum never used recipes for things she cooked for dinner; it was all in her head. I would tell Mum what I wanted to make and she would tell me what I needed, giving me a quick run down about what to do. As I didn't have Mum with me she would give me details about what it was suppose to look or smell like as she told me what to do. If I got stuck I would call out to Mum or bring her a taste so she could tell me if I'd missed anything. Most of the time I just tried to do it myself, using whatever knowledge I had to adapt into new things, as I didn't want to bother her while she was resting. I still cook like this today - paying more attention to how something should look, smell or taste more than anything else. Coming from a big family as well all of us now "grown up" kids have learnt to make dinner with as little as possible to keep the costs down. An ingredient my Mum always had was beef mince as it was so affordable. Today it is also a regular ingredient for me because it's just so quick and easy. I know a lot of you are the same, so here's another mince recipe for you, so it isn't just rissoles or spaghetti each time. I know it's not a traditional Moroccan recipe, but it's my spin on Moroccan flavours. There are four main Moroccan spices: Coriander, cumin, garlic and ginger. I'm not a massive ginger fan so I replaced it with a little bit of chilli as I love the combination of chilli and cumin in other dishes. Another addition is bacon, which I know shouldn't be in a traditional Moroccan dish but I just love how the bacon gets that little bit crispy and adds another texture into the meat. 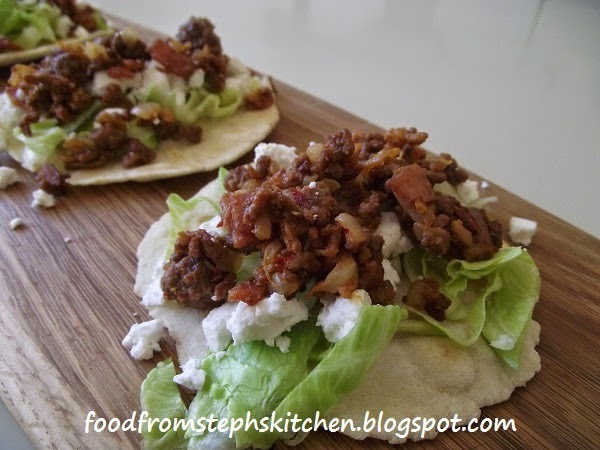 To tortilla filling: 180g goat's milk feta cheese (crumbled) and 120g shredded lettuce. You can also simply use your family's favourite salads and normal grated cheese. It's best to get your tortillas all rolled out first so that you just have to fry them off later. I usually start cooking them while I'm making my mince, but if you don't like doing things at once cook them before you get started on your mince. In a large bowl add in your flour, baking powder and salt. Mix these through and create a well in the middle of the dry ingredients. Next add your oil and water, stirring with a wooden spoon (or whatever spoon you are comfortable with) until it comes together into a dough. I usually mix until it starts to turn into a ball, then use my hands to knead all the strangler bits of dough together with the rest. Sprinkle some flour onto your bench or a cutting board and knead the dough for a few minutes until it feels smooth. What I mean by this is you don't want the dough to feel grainy or lumpy when you are kneading it. 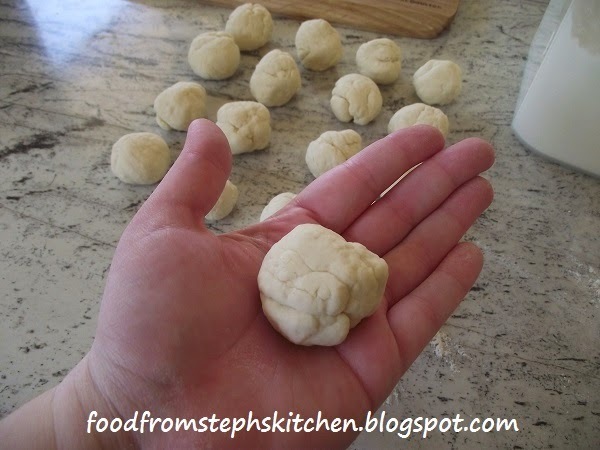 Once you're happy with your dough divide it into 18 small balls. You want the dough ball to fit nicely in the small of your hand. Now you can start rolling. Flour your bench again, flattening a ball slightly on the bench before you start to roll it out with a rolling pin. Don't stress about them not being round; they don't have to be perfect. If it makes you feel any better mine never are! You want to roll each one out until it is no more than 2mm thick. Once you are happy with your tortilla, sprinkle each one with some flour before putting them aside and moving onto your next one. The flour stops them from sticking together but you also need a little bit of flour on the outside for when you cook them. As I said, I usually cook mine off as I make the mince. For the purpose of this recipe we will make things a little less chaotic for those that already are multi-tasking with kids around them and cook these off first. (You go Mums!) 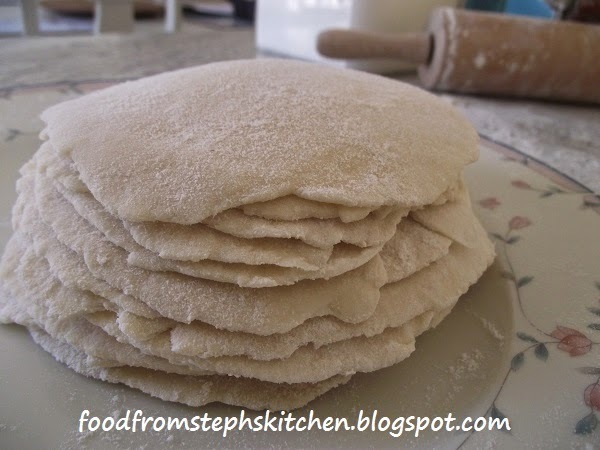 The best thing about these tortillas is you can make them up early (even the day before) and simply zap them in the microwave quickly so they are just warm before serving. Heat up an an electric pan or large frying pan over a medium heat. Once you can hold your hand over the top of the pan and feel the warmth, spray with a little bit of oil and add in your tortillas. You can add as many as you want, just make sure they are not over-lapping in any way. Cook the tortilla until you can see little bubbles appear on top, then flip them. They only need to cook a minute on the other side and they are done. All you really want to do is make sure they have a tiny bit of colour in places. If you cook them too long they won't be soft but rather crunchy. 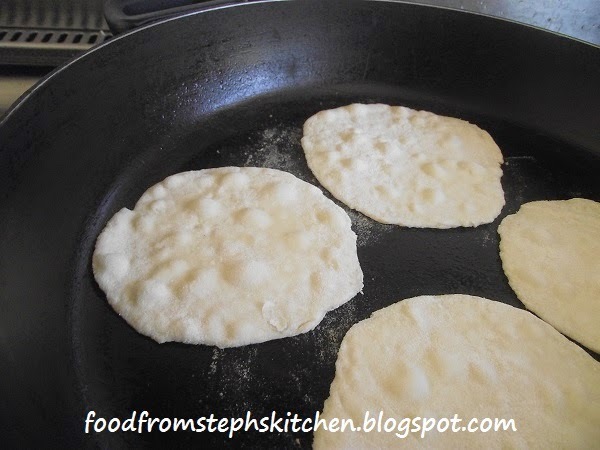 Continue cooking your tortillas, spraying with a little oil each time you add in new ones. 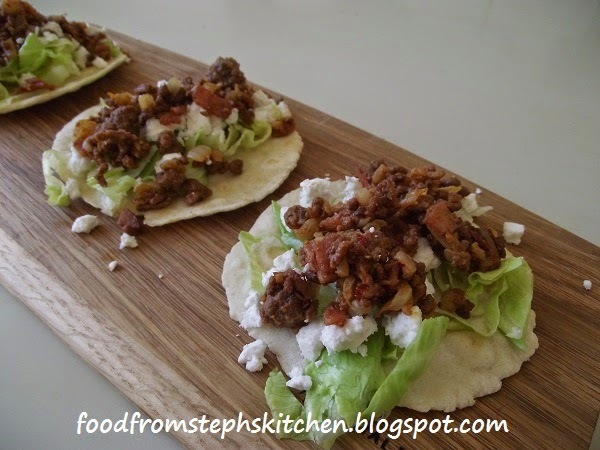 Once cooked place them aside and get started on your mince. Add your oil into a large frying pan over a medium to high heat. Once hot enough add in your onion. If you are using fresh chilli add it in with the onion. Saute your onion (until it appears transparent) before adding in your bacon and beef mince. Once you've browned the mince add in your spices, garlic and crushed chilli. Stir the mince for a couple of minutes until you can smell the spices and garlic cooking off. Lastly, mix through the BBQ sauce and you're done. 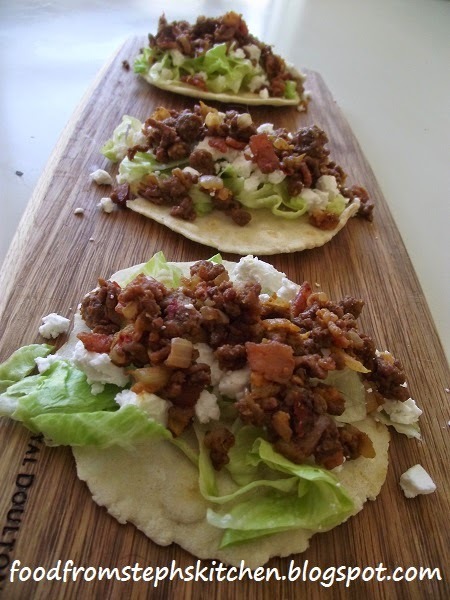 Simply serve the mince, cheese and lettuce in their own bowls on the table and let everyone make their own tortillas; kids love being able to "construct" there own dinner. If your family don't goat's cheese people simply use normal grated cheese or feta, and add whatever salads your family will actually enjoy.